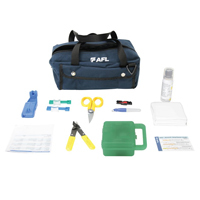 The FASTConnect universal Tool Kits provide all the necessary installation tools required for fiber preparation of 250mm and 900mm fibers, or 900mm, 2mm or 3mm cordage for AFL's pre-polished FASTConnect. Featuring either the , CT-06A fiber cleaver, the FASTConnect Universal Tool Kit contains all the industry standard termination tools required for fiber preparation. Additionally, the carrying case has adequate storage for extra FASTConnect for on-site convenience.